While sewing has been happening, there’s also been some beading going on. An order of curved tooth dagger beads arrived a week back and I just had to make something with them. Enter Seaward, as in heading to the sea. 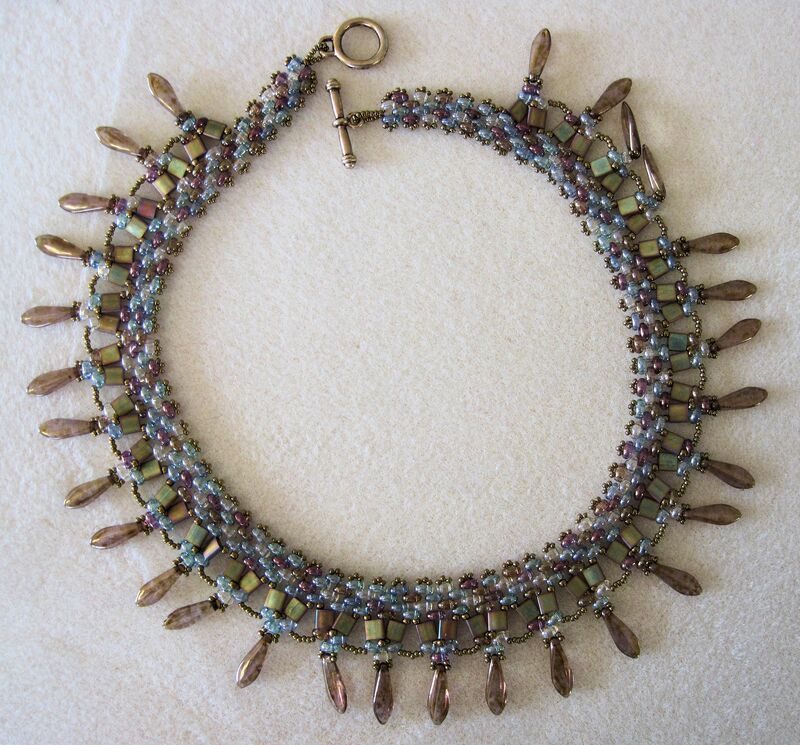 The bracelet was loom woven, using a mix of blue galaxy tooths (tooths. I just love that word) and chrome finish seed beads. The whole is anchored with brushed steel end caps and a piscean clasp. 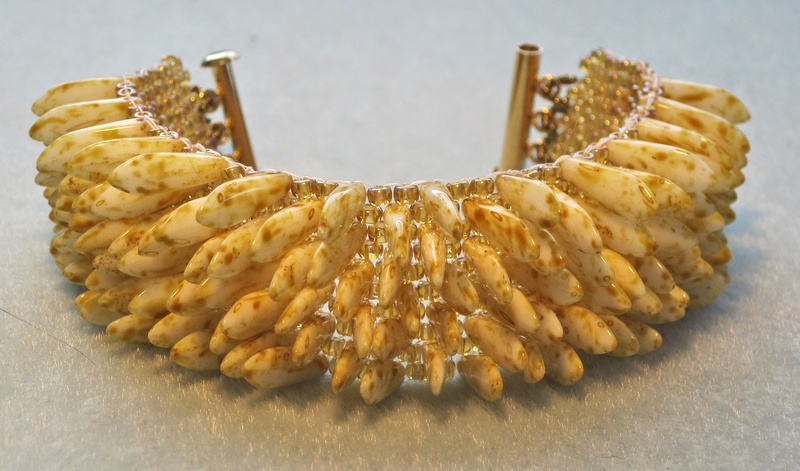 Edges are reinforced with a picot of silver beads. I suppose using vintage and fresh in the same sentence has the grammarians rolling their eyes, but there you go. A necklace that breaks with convention. 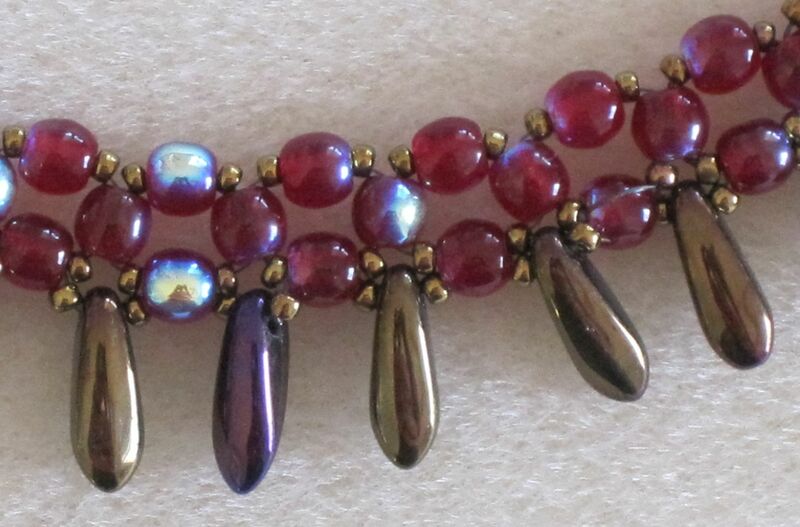 New bead shapes combined with an old beading style. The new shapes are tila beads and super duos, the tilas in a matte khaki and the luminous super duos forming the body of the band. These are stitched together with bright bronze 15°s and accented with bronze tortoise shell daggers. The stitching is peyote, which made me very nervous. The way the beads are laid out, there isn’t a good way to put in any knots or ties for stability. Should the thread break (a rare possibility) I didn’t want the beads to run helter skelter away, so some experimentation was required. I finally managed it – not optimal, but functionally acceptable. The two holes in the tilas and super duos drove me absolutely nuts. The tilas in particular would flip one way, then flop another. 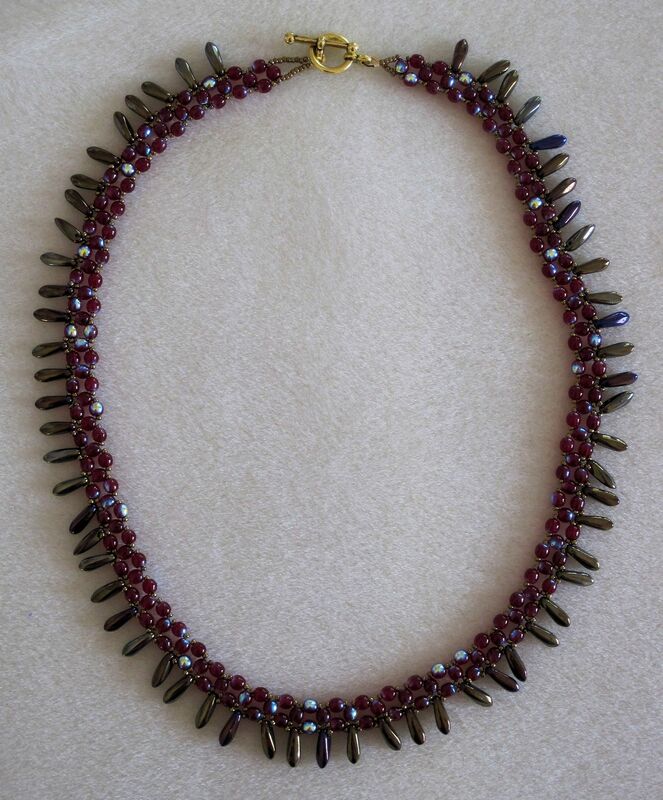 Finally, I reached a beady groove, that zen state where all the beads behave themselves. There I was, last Tuesday, at the local Farmer’s Market, when an absolutely intoxicating scent overwhelmed me. Ah! I was standing next to the fresh strawberries. Even in late August (which it was, last week) they were still ripe with sunshine and warmth. The epitamy of Summer. Can scents become inspiration? Even when one is not a parfumier? I certainly believe so, and this bracelet is a fine example of that! The ripe red of the berries, the light pink of the centers. A little prickly on the outside from the seeds. Yum! So, what mermaid would wear this? (All the dagger bracelets are in the Mermaid Series). I have no idea, but she obviously spends time around the strawberry patch. Fruity Mermaid? Midsummer Mermaid? Her work is never done! She’s responsible for helping out during all those oily disasters, sending mammals to the shoreline for cleaning, and heroically restoring order when is seems there is none in sight. Day in, day out, it’s one catastrophe after another. No wonder she’s a considered a curmudgeon by her seafaring sisters. At least she has good taste in jewelry. Perhaps this is the solidified remains of a long ago spill? Anyone remember the Exxon Valdez? Oil Slick, another in the Mermaid Series. 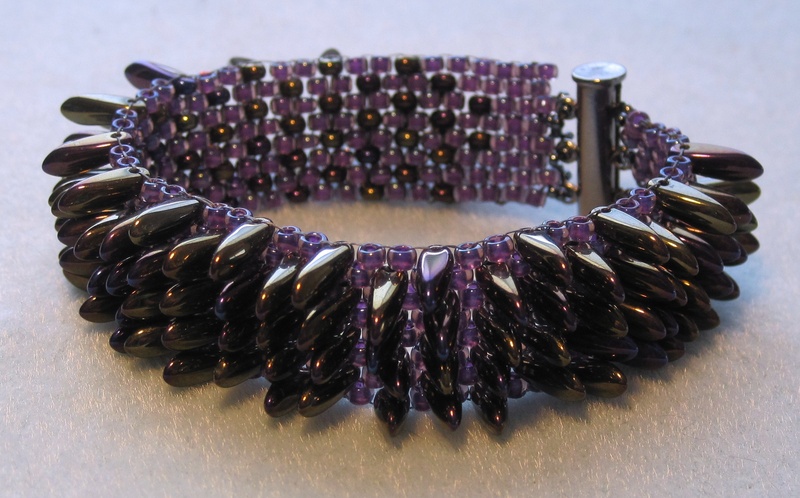 This one is dark and sparkly, made with size 8 seed beads in a pure grape and some very iridescent daggers. These daggers, at 11mm in length are neither as long nor as wide as those in Old Bones, but they work equally well. I remain surprised by this series. They all look so formidable, yet in the hand, and on the wrist, they are supple and slinky and quite sensuous. Looks can be deceiving, even with beadwork. Another bracelet in the Mermaid series. This one looking like Old Bones. Which is not a bad thing. Perhaps this mermaid saved them from a worse fate? Maybe the bones are left behind when their earthly owners no longer needed them. Much better to adorn a Siren of the Sea than the belly of a beast, don’t you think? Though this bracelet is very simple, simplicity, in this case, is absolutely what is called for. 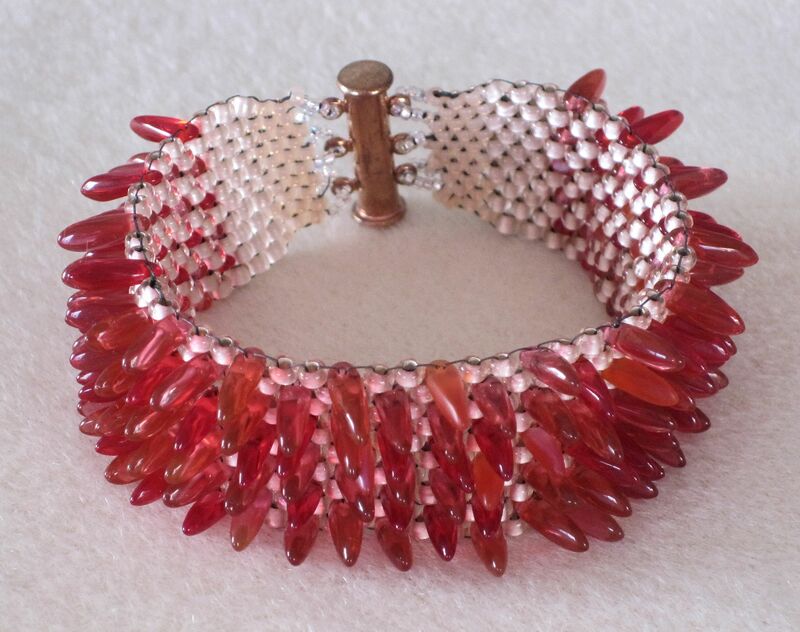 The base beads are topaz with an aurora borealis finish, while the daggers are mottled cream and tan. 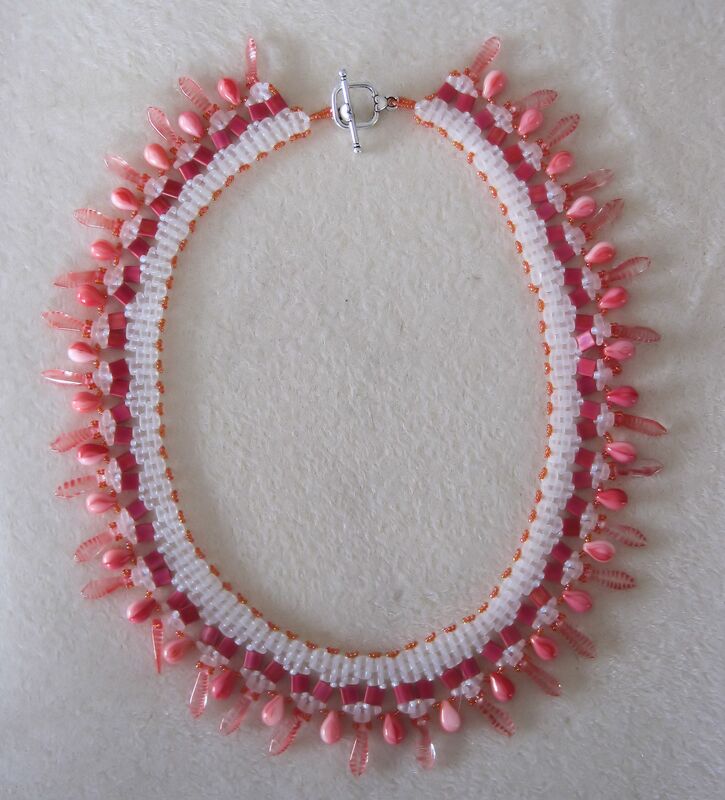 There is quite a bit of interplay between the opacity of the bones and the watery highlights of the seed beads, as well as movement when the daggers wave too and fro. The whole is closed with a nice hefty slide lock clasp. Why no daggers near the clasp? Well, it’s ergonomics you see. You have to be able to wrest your wrist at some point during the day, don’t you think?